Kathryn Kuhlman is a woman who loved God and believes God for healing miracles. Her book, I Believe in Miracles, will inspire you to believe in the impossible. 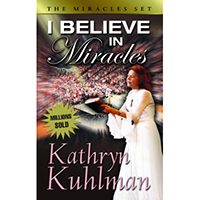 Since Kathryn Kuhlman believed in miracles, and the power of God so deeply, people received healing. Her faith in Jesus helped her see many people healed from many types of diseases. Her healing services moved with anointing power for healing. Also, she believed that God is still in the healing business! In this book, you will meet twenty–one ordinary people who needed a unique touch of God’s healing power. If you are sick, dealing with a debating disease, this book, through the incredible ministry of Kathryn Kuhlman, your prayers answered. Likewise, your faith will be inspired as you read about Carey Reams throw his crutches away. You will weep when you read about George Orr restoration of his sight. Your heart will be touched as you read about Elizabeth Gethin’s heart condition healed by the power of God. You need encouragement and hope for healing miracles, get this book and be inspired. Your faith will grow to believe in the miracles of Jesus.